You are so beautiful, no wonder you like to groom yourself. At seven years old you have been well taken care of. Hi Bambi in Norway! Happy Pet of the Day to you, from all in this piggy loving home! What a beautiful Abyssinian girl you are, Bambi! Your caramel and cream coloring, that trademark long, flowing coat of yours are gorgeous! (All that time you spend primp sure pays off, hehe) And by all accounts, you're every bit as beautiful inside as out! How blessed your mommy was, the days she welcomed you home, an amazing 7 years ago! All pigs are special, but it's clear you earned an extra special place in your human's heart, and deservedly so! In looks, personality and heart, you're as special as they come, a treasure! Many thanks to your mom for sharing you beautiful, sweet self with us, giving us the chance to pay tribute to one most deserving girl! I hope you're enjoying a very special Pet of the Day celebration...treated to extra floor time, playing with your Rex piggy pal; munching on yummy treats; cuddling with your mom, being loved and pampered to pieces! Lots of love, cuddles and kisses to you, beautiful Bambi, our very special and most deserving Pet of the Day, EVERY day! Love to your dear Rex pal, too! Dearest Bambi, what an adorable little Abyssinian Guinea Pig you are! You are absolutely precious, with that pretty-colored fur and the sweet face with those long whiskers and lovely big eyes. You do a fantastic job of primping and preening! You look like you are smiling in those great photos, and thank you for sharing them with us. You have a delightful personality, too, along with your friend Rex, whom we can just see behind you. I wish I could reach through the screen and over to Germany to pet you both! I can't, of course, but I know your loving and beloved person will pet you for me . 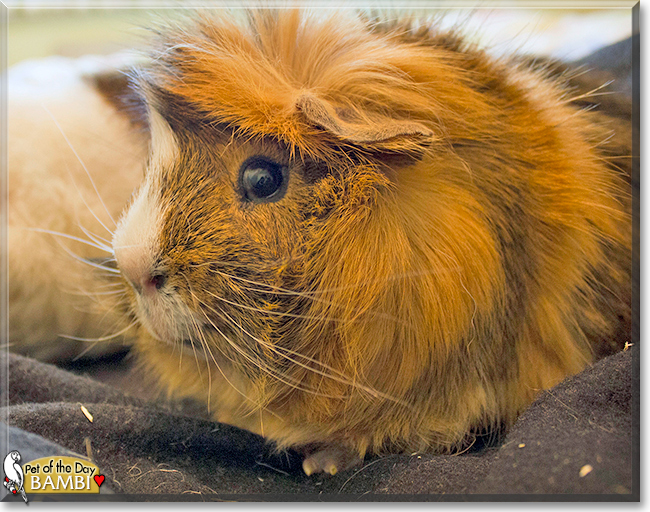 Congratulations, darling Bambi, on being chosen today's Pet of the Day! We hope you and Rex and other family members (all species) and friends are enjoying a fine celebration, full of fun and lovies and all your favorite games and treats. Last edited by phesina; 11-01-2018 at 05:03 PM. Bambi is just priceless! It is very funny that she always makes sure to look her best. Sweetest little POTD ever! Congrats to beautiful Bambi on being Pet of the Day!